After a few days of work, I have a functional first draft of a reasonably robust JSON-LD serialization for physical objects published in the Numishare platform that conforms to the linked.art data model. I have pushed these changes into our production server, and you will have access to this new export format in both the ANS collection, Mantis, and the Egyptian National Library collection. The linked.art export is currently available as a direct serialization of the canonical NUDS/XML published by Numishare, but I will expand the support to include proposed linked.art search APIs once they have been fully documented. You can access these serializations either by appending ?profile=linkedart to the .jsonld URL (e.g., http://numismatics.org/collection/1944.100.51606.jsonld?profile=linkedart) or by using profile=\"https://linked.art/ns/v1/linked-art.json\" in conjunction with application/ld+json in the Accept header via content negotiation. (I am not sure this is the formal profile URI yet, so I may update this later). Not all of our data have made it into this iteration of the linked.art export. It includes titles and accession numbers, typological metadata like material, typological classification, production event, and legends and visual iconography that appears on the obverse and reverse (but not complex issues like symbols and their placement), basic measurement data (axis, weight, diamter), and lastly, digital images, including IIIF resources. We haven't included provenance or other sorts of physical peculiarities (secondary treatments, wear, etc.). Like all of the objects in the ANS collection, the best quality data are in the Roman department or Hellenistic coinage that has been connected to online type corpora such as OCRE or PELLA. The linked.art output only includes entities that have been linked to Nomisma URIs--materials, denominations, authorities, places, and people or deities depicted on the obverse or reverse of coins. This stater of Philip III Arrhidaeus is linked to a coin type defined in PELLA. The typological metadata are not actually stored in the NUDS record in Mantis itself, but Numishare requests the machine readable data directly from PELLA. 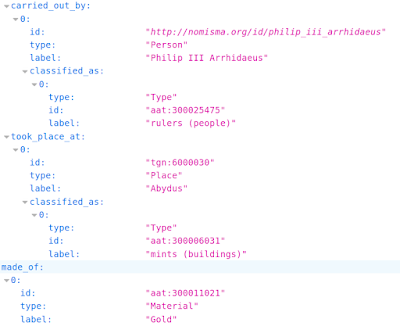 Numishare then reads all of the Nomisma URIs from this typological data to make an API request to Nomisma.org in order to get RDF for each skos:Concept related to the coin type. The XSLT that generates this JSON-LD from NUDS will look for and use a Getty vocabulary URI stored as skos:exactMatch or skos:closeMatch in Nomisma. 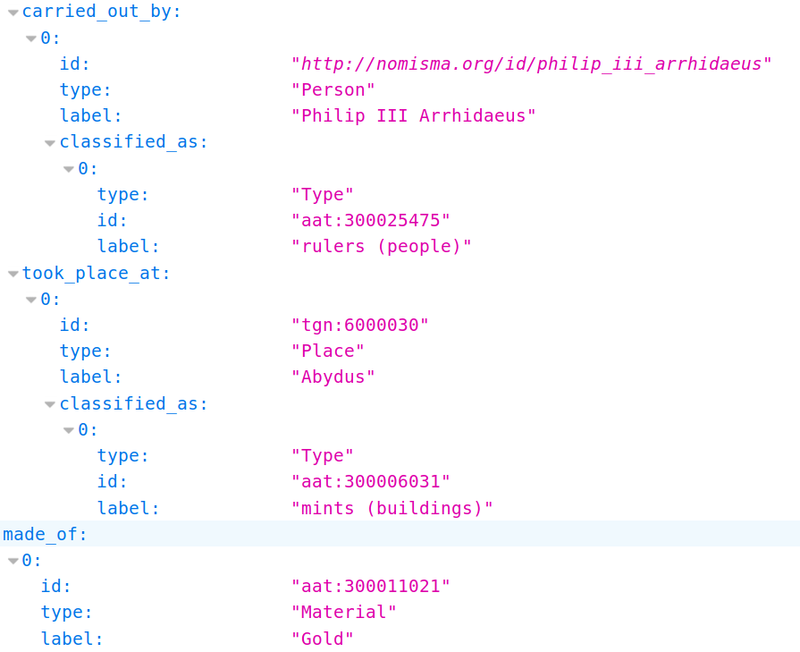 If none is available, then the JSON-LD will use the Nomisma URI instead. As you can see in the above figure, the ULAN URI for Philip III Arrhidaeus has not been resolved, because it doesn't exist in Nomisma's RDF because it hasn't been minted in ULAN. Abydus and Gold, however, do exist in TGN and AAT, respectively, and have already been coreferenced within Nomisma.org. So while Hellenistic and Roman Republican/Imperial coinage are the most likely to be fully robust and integrated with Getty URIs, the vast majority of the ANS collection hasn't been linked to Nomisma-oriented typologies. Hopefully, as we migrate from Filemaker to another platform, we will systematically link all of our other departments to the relevant authority files to facilitate better quality LOD output. In any case, this is a major step forward in making our materials accessible to a broader audience of researchers and developers within art history. The Leeds University Library is the newest contributor to the Nomisma.org consortium, contributing data for 61 Alexander the Great coins in its collection to PELLA. There are 20,266 Alexanders in PELLA from 15 different institutions. 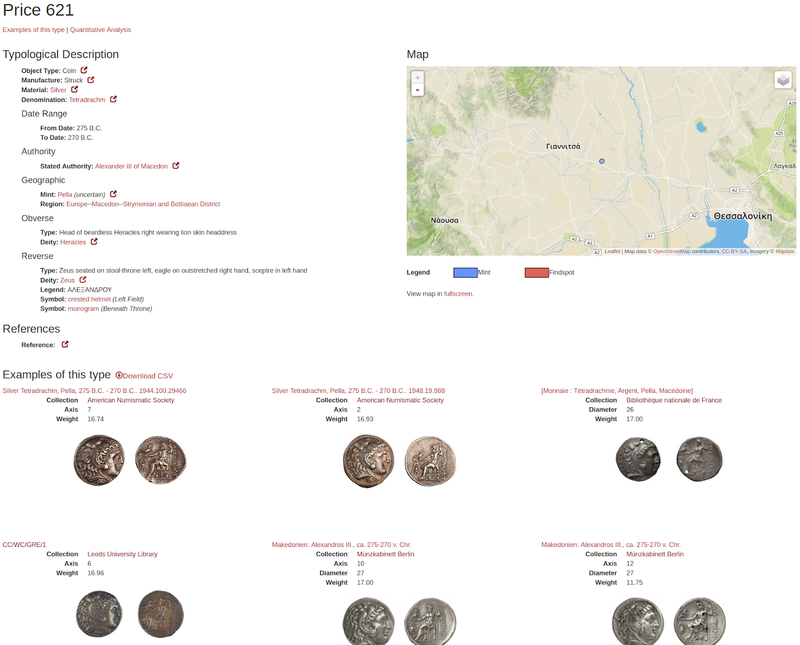 In related news, Oliver Hoover is putting the final touches on the Seleucid Coins Part II spreadsheet and the first part of the gold and silver coinage of the Ptolemies is nearly ready to go online. Look for the fully-published Seleucid Coins Online and the first iteration of Ptolemaic Coins Online by the end of August. I have made some minor modifications to the coin type pages in OCRE, CRRO, etc. A relatively small number of types across these corpora have more than 100 total specimens, but more importantly a very small handful of types are linked to several hundred or even more than 1,000(!) physical specimens. For example RIC 10 Honorius 1228 is associtaed with 2,396 physical specimens, nearly all of which are in the British Museum (presumably from one or more hoards). This is the single-largest number of specimens associated with a coin type. In these extreme cases, the amount of data to load into one HTML page is simply too great, resulting in the browser overloading and running out of memory. In order to ameliorate this issue, I have introduced pagination. The number of results per page can be set in the Numishare config, but the default is 48 (16 rows of 3 columns). The page is set by a page request parameter, which is converted into a proper offset in the underlying SPARQL query. The pagination buttons, then, are crawlable by robots since each hyperlink will resolve to a URL (so no AJAX here). Nearly 400 total coin type URIs have more than 48 specimens (out of roughly 55-60,000 total Hellenistic or Roman coin types across all projects) for which pagination controls will appear. About 100 types have more than 100 specimens and 5 have more than 1,000. In addition, when physical specimens are present, the user can click to download a CSV file for the metadata about these specimens. It is the same basic query that populates the HTML page and includes URIs for each object, title, measurement data, URLs to images or IIIF services, findspot/hoard data, and source collection/dataset. This should make it easier to use coin type and specimen data for analysis in R or other platforms.